Unlike a certain Plattsburgh TV station with its news department this blog doesn't crow every ten minutes how perfect it is. Yes, I make dumb mistakes, typos and misspellings. But I try to catch stuff through spell check and Google. It takes less than a minute to verify a word or term. Shouldn't a professional journalist do the same? If you watch WPTZ-TV/Channel 5 you become overexposed to the same ads being relentlessly recycled about the professionalism and magnificence of its news team. These spots are annoying, not informative. They seem to show up during every commercial break. Praise my remote control! I hit the MUTE button or change the channel. How many other viewers react the same way? There's a big difference between boosting and boasting. "Channel 5: Where the news comes first." Hearing that slogan for the nth time is like water torture: a steady drip burrows a hole into your forehead. Sometimes two ads vaunting the WPTZ news team are shown in tandem, doubling the amount of vexation. Contonement? Phonetically correct but still wrong. If you Google Search the term "contonement" Google tells you that it's "cantonment." So how did this get by the Magnificent Channel 5 News Professionals? Admittedly cantonment isn't a common word. Also its pronunciation doesn't match its spelling. But didn't anyone on the crack News 5 team ever read a newspaper article or news release about Pike's Cantonment? Stories about the archeological dig at the site have been in the newspaper. I'm assuming that WPTZ received a news release about the discoveries at Pike's Cantonment with the right spelling. I also asked a history expert and even consulted the Oxford English Dictionary to be sure that the spelling used by the Channel 5 reporter was indeed incorrect. In the meantime the news story with the incorrect spelling hasn't been fixed the last time I checked wptz.com before posting this. I might be a "lowly" blogger but I do correct my mistakes. Sorta acting like a professional, ya know? Channel 5: Show, don't tell, how great you are. Stuff the bloviation. ARC students shared their visual and musical talents at the ROTA Gallery Monday afternoon after successfully completing two courses sponsored by the art co-op. Images were arrayed on one wall by students who participated in the photo class conducted by Meghan Risley and Kaitlyn Donovan. The instructors showed how to work with various camera techniques such as perspective. Graduates of a drumming class taught by Kimberly LeClaire provided an energetic performance with bongos, congas, and tambourines. Instructor Kimberly LeClaire (left) leads her drumming students during the one-day ARC photo exhibit at ROTA Gallery. Author Joy A. Demarse discusses her book based upon local historical events during her Saturday afternoon presentation at the Plattsburgh Public Library. Fourteen-year-old Hiram Walworth struggles with his conscience: can he shoot another person while defending his village and country? Author Joy A. Demarse read that scene from her book, "Nine Days a Soldier," to show how she used fiction to bring history to life during her presentation at the Plattsburgh Public Library. The book is set during "Mr. Madison's War" (referring to then-president James Madison), what is called today the War of 1812. 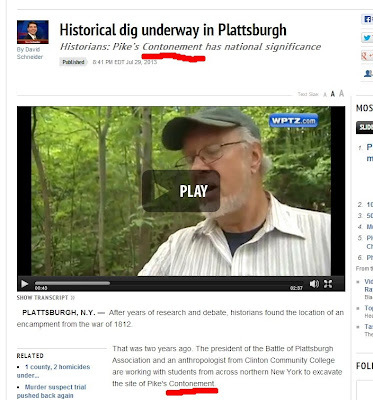 It is based on actual events that occurred in the Plattsburgh area in September 1814. While written for younger readers adults have also enjoyed the book, learning about another part of the war that has been overshadowed by the naval battle on Lake Champlain. The land battle, Joy explained, may not have been as romantic as the one on the water but it was just as important in the struggle to drive off the British invasion from Canada. The American forces were greatly outnumbered, she explained. British troops had amassed in Montreal but U.S. Secretary of War John Armstrong, Jr. thought they would move to Kingston, invading at Sackett's Harbor. Armstrong ignored warnings from U.S. Commanding General Alexander Macomb and others that the British would probably use Lake Champlain as an invasion route. The Americans, Joy continued, were outnumbered by almost three to one. Some schoolboys from Plattsburgh Academy volunteered but that presented a problem for Macomb who wrote the Army rule book: volunteers needed to be at least 18 years old or have permission from their parents. "Nine Days a Soldier" details how the general found a way so that the boys could take up arms as Aiken's Volunteer Rifle Company. Plattsburgh Academy once stood on the same site where the Public Library now stands, Joy said. The second floor auditorium where she was now speaking might share the same space of the Academy's second floor. With this historical backdrop Joy decided to make Hiram Walworth, the youngest volunteer, as her protagonist, showing events through his viewpoint. She mentioned that she had taught boys in the ninth grade and couldn't imagine most of them engaging in combat. While engaging the reader through fiction Joy said she tried to be as historically accurate as possible. She wanted to go beyond "dry" history, i.e., a summary of events and dates. She didn't know if Hiram had a sister but created such a character to add to the drama. Her target audience, she said, were readers in grades 5 - 7. While working on her manuscript she had "focus groups" of such readers who helped her with feedback and suggestions. One reader said that besides dates he would like each chapter to have a title to indicate what it was about. That suggestion was incorporated in the final manuscript. Author Joy Demarse reads an excerpt from her book, "Nine Days a Soldier." Listening (left to right) are Gabe and Ryan Sexton with their mother Kelly Julian. 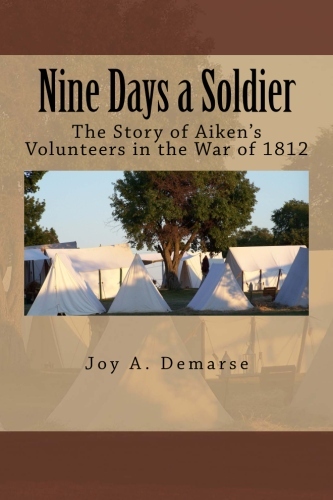 "Nine Days a Soldier: The Story of Aiken's Volunteers in the War of 1812" is available at bookstores such as Barnes & Noble and online sellers like amazon.com . Locally it can be purchased at Battle of Plattsburgh Museum at 31 Washington Road, the Old Base Museum Campus in Plattsburgh - (518) 566-1814. Also Joy will be selling her book at the Farmer's Market on August 10; the market is located in the downtown Plattsburgh City main parking lot. And the book will be available during the Battle of Plattsburgh commemoration in September. During a recent eight week class photography instructors Kaitlyn Donovan and Meghan Risley helped students from the local ARC (Advocacy and Resource Center) gain a better understanding of their digital cameras. The students' efforts will be on display for one day at ROTA Gallery on Monday, July 29, from 3:30 to 5:30 PM. The public is invited to stop in and see a variety of photographic styles and viewpoints. Through the photo class students learned how to shoot in different situations. The class was sponsored under the auspices of ROTA. The gallery is located at 50 Margaret Street. More info: email - rotagallery@gmail.com ; website - www.rotagallery.org . Photo and cutline from a full page ad in the Press-Republican. Armed guards or actors? Your local newspaper should be trustworthy, stand behind what it prints. It shouldn't assume "caveat emptor" is in the mind of every reader. But that warning sprang to mind when I read a full page spread in today's Press Republican on page B5. At first glance it appears to be a news article but tucked up in the upper left-hand corner is the disclaimer: SPECIAL ADVERTISING FEATURE. Meaning an ad, not real news. A headline proclaims: "State zip codes determine who gets free Silver coins." 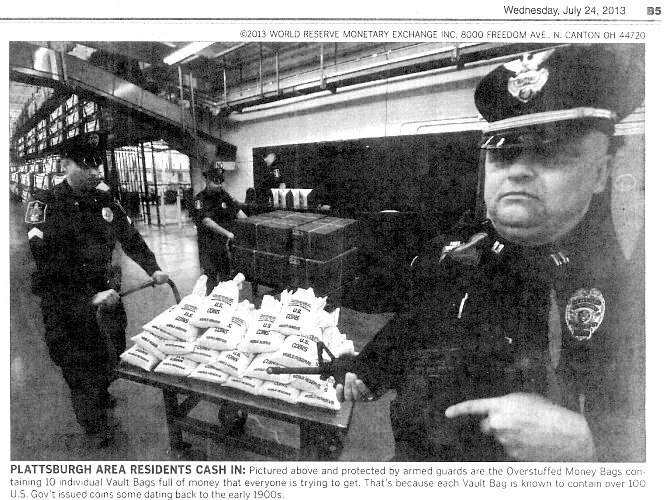 It's followed by this statement: "Vault bags loaded with U.S. Gov't issued coins are up for grabs as thousands of U.S. residents stand to miss the deadline to claim the money; now any resident of New York who finds their zip code listed below gets to claim the bags of money for themselves and keep any valuable coins found inside by covering the Vault Bag fee within the next two days." Suckers — oops, I mean readers — drawn in by the headline read on how this can be a great deal because "Each Vault Bag is loaded in part with highly sought after collector coins." It touts: "Just think what some of these coins could be worth someday." The key words: "could be." This is not the first time the PR has run an ad that got my skeptic sense tingling. As I've documented before at this blog, it ran full pages ads for another company, Treasure Hunters, that a Google search revealed to be controversial, to put it politely. So I fired up the computer and did a Google search for the company behind this latest advertorial, World Reserve Monetary Exchange, Inc. Bad show when the results pop up, especially in the top five. Check out the comments regarding WRME at Ripoff Report and @pissed consumer. Angry customers complained that they overpaid many times for what they found in the Vault Bags. The coins are sealed when received. To find out what coins have been sent you have to remove the seal. After discovering what they really received, dissatisfied customers wanted to return the product. Hopefully they read the print at the bottom of the full page ad: NO RETURNS IF SEAL IS BROKEN. Ten minutes with Google search and I found enough info to see that this deal is apparently too good to be true. One hit brought me to a news article, "Collectible coins or a bag of lies?," by a Portland, Oregon TV station discussing the problems with WRME and its Vault Bags. Apparently the KATU-TV news team knows how to do a bit of investigative reporting like real journalists. So does the Press Republican have standards that advertisers must meet before ads are accepted? Or does it just take the money and leave someone else holding the bag, i.e., "This newspaper is not responsible for any deceptive claims made by advertisers." Maybe no one there knows how to use Google search. Or they do and are afraid what it might uncover. Past and present will meet this Saturday, July 27, at 2 PM at the Plattsburgh Public Library. PPL is the former site of Plattsburgh Academy, one of the key locations in the book, Nine Days a Soldier, by local author Joy A. Demarse. This fictional work, set during the War of 1812, is based on actual events. In September 1814 Plattsburgh Academy schoolboys want to defend their village from British forces that have crossed the Canadian Border. They become Aiken's Volunteer Rifle Company. While intended for younger readers (grades 5 - 7) adults have also enjoyed the story for both its adventure and historical detail. Joy will discuss her book in the PPL second floor auditorium. The event is free, open to readers and history buffs of all ages. For more information contact Kelly Julian at (518) 561-0921 or email her at sextonk@cityofplattsburgh-ny.gov . 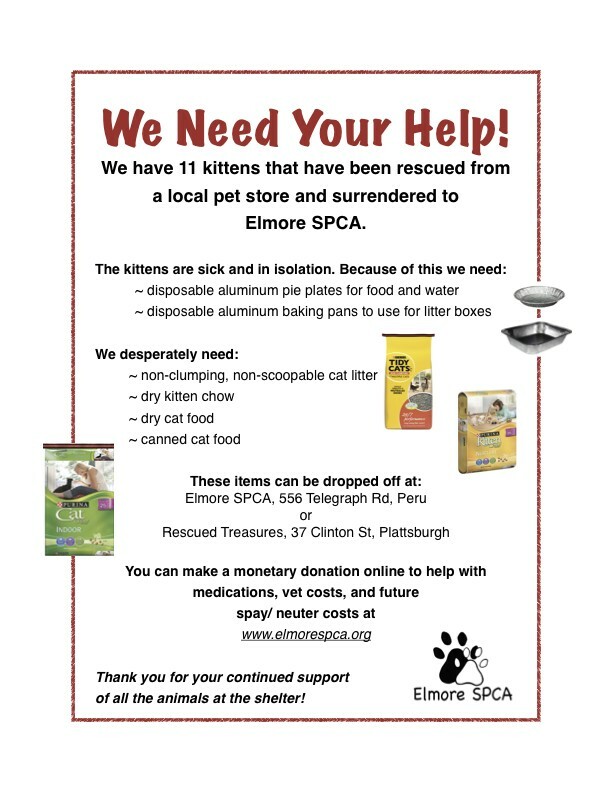 The Elmore SPCA (Society for the Prevention of Cruelty to Animals) has requested through a recent news release for donations to provide for sick kittens rescued from a local pet shop. According to shelter manager Rebecca Burdo many of the kittens suffer from various ailments including ring worm, mites, and upper respiratory infections. The kittens have to be kept in isolation until they are healthy and so will not be adoptable for some time. 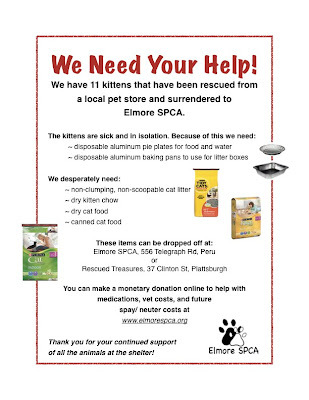 Donations can be made in person at Elmore SPCA, 556 Telegraph Road, Peru and also at Rescued Treasures, 37 Clinton Street, Plattsburgh. For more information go to the Website, www.elmorespca.org . You may also make monetary donations online at that site or by postal mail: Elmore SPCA, PO Box 656, Peru, NY 12972. The shelter can also be reached by calling 518-643-2451 . A rainy day doesn't stop Bucky Seiden from her window painting. Protected by a large umbrella she decorates a pane at Urban Soles on Durkee Street for the upcoming Mayor's Cup celebration. Bucky works from reference sketches she has prepared. Sometimes, she says, the high humidity can cause problems with the paint refusing to stick to the glass. Meg Risley (right foreground) discusses imaging with fellow photographer Ron Nolland at the opening Friday evening of her exhibit at the Champlain Wine Company. Her exhibit includes some abstracts made by baking or boiling photographic film with added ingredients such as oats. Sponsored by ROTA Gallery Meg's work will be on display for the next two weeks at the wine store at 8 City Hall Place as part of the downtown Art Walk..
WIRY 1340-AM radio "personality" Ducky Drake recently resigned from the station, ending his twice-weekly bloviations under the title of "Is It Just Me?". Ducky is infamous for his commentary about saving Plattsburgh City money by completely shutting down its public library and having other libraries – such an elementary school one – providing the same service. He also opposed the city helping PPL with a budget shortfall. If the aid wasn't provided people would have been thrown out of work. Even with the aid employees had to take pay cuts. Please note that Ducky is gone but Plattsburgh Public Library is still around. About twenty movie fans of all ages attended the free showing at the Plattsburgh Public Library of "Oz The Great And Powerful" this evening. The next PPL free movie will be "Wreck-It Ralph" on Saturday, July 6, at 2 PM. This series is made possible by the Friends of the Library.